Tucows’ Tiered Access Compliance & Operations portal (which we commonly refer to as a “Tiered Access Directory” or “gated Whois”) launched at the end of May 2018. With its launch, our public Whois “went dark.” From that date forward, all personal registrant data has been redacted from the public Whois by default, and made accessible only via the gated Whois. Most people saw this is a good thing—registrants deserve to have their personal information protected. A few argued that the change would impede efforts to identify and take legal action against cyber criminals and trademark or copyright violations. We’ve always advocated that a balance could be reached. Now, eight months into our Tiered Access program, we’re looking back at the data access requests to see what the numbers reveal about how the system is working out. Perhaps surprisingly, 70% of data access requests are not fulfilled because the requestor did not respond to Tucows’ requests for additional information (including assurances regarding who the requestor was, how the data would be handled, and why the data were needed). For example, some requests failed to include the requestor’s own identity, their legal basis to access the information, or even which specific domain name they’re asking about. In all cases, we reply promptly to ask for the missing information but, so far, for 70% of the requests we have received, that information was never provided. Whois (pun intended) requesting registration data? The vast majority of requests—just over 90%—come from commercial litigation interests and relate to a suspected intellectual property (copyright or trademark) infringement. 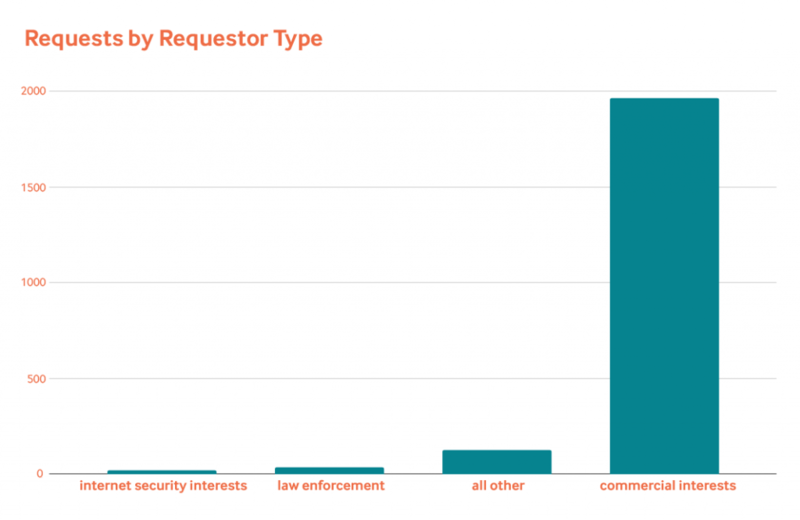 The remaining 10% are spread across other types of requestors, including law enforcement, security researchers, registries, the registrants themselves, and third-parties interested in purchasing specific domains. Within the “trademark” category, 76% of all requests are on behalf of a single entity. The next highest entity requestor accounts for only 7% of trademark requests. Interestingly, we have had only a single request that appears to be related to illegitimate pharmaceuticals being sold online and zero requests related to terrorism. These are categories that we were led to believe we would receive a high volume of requests for. There are also a significant number of requests for personal data that we’ve excluded from the stats and total number referenced above: those made by ICANN Compliance. These were not included because, although ICANN Compliance has requested personal data from us in relation to complaints filed by third-parties, they have not yet demonstrated a legitimate purpose for processing that data. 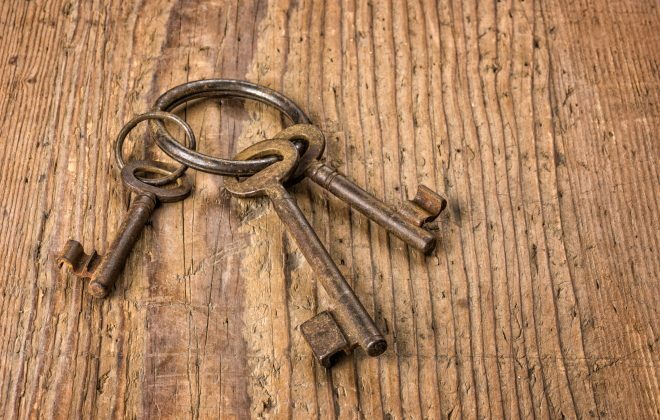 Since the introduction of our Tiered Access system in May, no Tucows-owned registrar has shared any personal registration data with ICANN Compliance; we have discovered that we can successfully help ICANN’s compliance investigation of registrant or third-party requests without disclosing any personal data to ICANN. We are always looking for innovative solutions that allow us all to rethink the traditional way of doing things. These spikes and the prevalence of certain requestors strongly suggests an attempt to skew the data to create an argument against the loss of public Whois data. Regardless of that attempt, however, what we clearly see is a system working the way that it should: when sufficient legitimate interest is shown and assurances regarding the handling of data are made, the process of providing personal data is smooth. The sky didn’t fall. The dire predictions that commercial litigation, law enforcement, and security research interests made prior to our GDPR implementation did not come to pass. Our Tiered Access team is able to respond to requests in a timely manner and to provide access to registration data when the requestor can demonstrate their legal basis for access. The system works well. There remains much to be done regarding Tiered Access. The “Technical Study Group on Access to Non-Public Registration Data”, a recently-created group of ten members hand-picked by the ICANN Board, is engaged in technical work on Tiered Access, although not the thornier legal or policy challenges. There is a lot of work happening in the ICANN Community as well. The Expedited Policy Development Process (EPDP) Team work has not yet been finalized; a Registrar Constituency document outlining guidelines for requesting registrant data will be published soon; and there are ongoing informal discussions among registrars and other interests intended to streamline access and make it less difficult and confusing. The EPDP’s Phase 1 Final Report, which will focus on data collection and, later, its Phase 2—which will be focused on a Standard Access Model—may affect what we collect and disclose in the future. We won’t know what the Tiered Access system will look like long-term until there is clarity around these items, which are still very much up in the air. That said, we’re in a position to adapt our system to meet the ICANN Community’s final requirements. In the meantime, we’ve created a solution that achieves an effective balance between protecting registrants’ right to privacy and providing legitimate third-parties timely access to the data they’re legally entitled to. As we’ve said before, while it marks a big change in the domain space, the introduction of our Tiered Access Compliance and Operations system is a move in the right direction, in step with evolving privacy laws across the globe. Tucows remains committed to protecting registrant privacy and applauds the efforts underway by various governments to establish privacy-by-default standards. If you sell .EU domains to UK residents, you may already be aware of an announcement made by the European Commission last March on the future of .EU domains registered to UK organizations and individuals. In short, once the UK officially withdraws from the European Union, individuals with an address in the UK and Gibraltar, and UK companies without a presence elsewhere in the EU, will no longer meet the eligibility requirements. 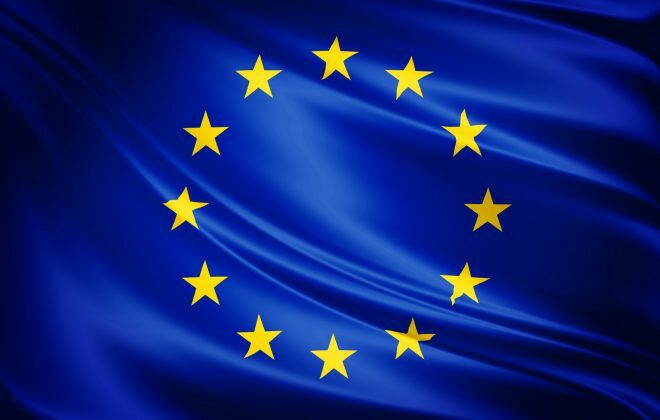 Much to the disappointment of the domain community, the European Commission has decided against “grandfathering” the 300,000 .EU domains already registered with a GI or GB country code, an action which would have allowed existing owners to renew their domains indefinitely, despite the country code no longer being eligible. We would have appreciated a more creative solution than existing registrants simply losing their right to ownership. Regardless, it’s time to start preparing affected registrants for this change. Hard Brexit: The UK leaves the EU with no deal on March 30, 2019. Soft Brexit: The UK leaves the EU on or after December 31, 2020, following a planned transitional period. Soft Brexit with .EU Provisions: The UK leaves the EU with a planned transitional period, and the deal includes provisions for .EU domains. Below you’ll find what each of these three scenarios would mean for .EU registrants based in the .UK. If the UK leaves the EU on March 30, 2019, without having reached a withdrawal agreement, here’s what will happen. You can also jump to the summary table below. Starting at March 30, 2019, 00:00 CET (March 29, 2019, 19:00 EDT), EURid will immediately stop allowing new registrations of .EU domains using a GB (Great Britain) or GI (Gibraltar) country code. For existing domains, EURid will no longer allow registrant transfers to GB or GI residents. In March 2019, EURid will contact existing registrants who have listed a postal address with a GB or GI country code, giving them “the possibility to demonstrate their compliance with the .eu regulatory framework by updating their contact data.” For organizations, this would involve indicating a legally established entity in one of the eligible EU27 or EEA Member States. For individuals, this would involve updating their residence to a physical address located in one of the EU27 or EEA Member States. The registrant may also choose to transfer the domain name to an EU resident. During this two-month window, UK registrants who wish to keep their domain active must update their contact info to satisfy the eligibility requirements or transfer the domain to an EU resident. 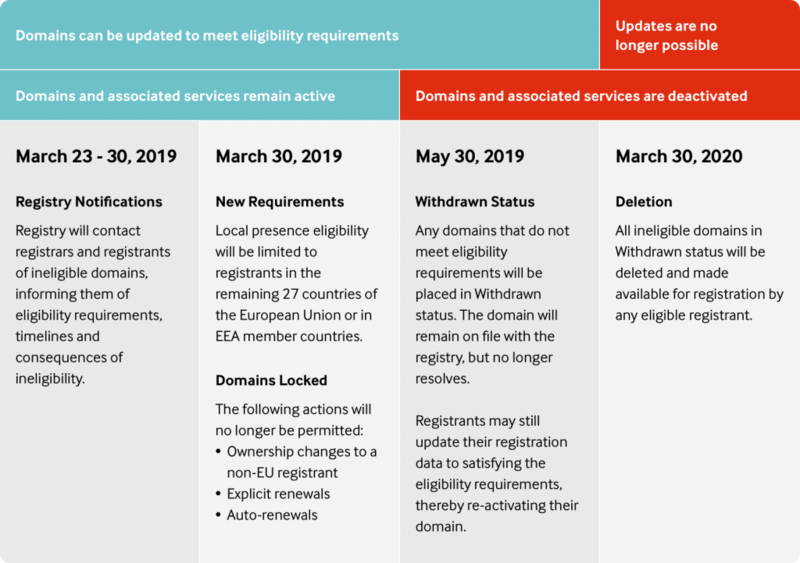 On May 30, 2019, at 00:00 CEST (May 29, 2019, at 18:00 EDT), any registrant who has failed to demonstrate their eligibility will have their domain placed in Withdrawn status — the domain won’t resolve (and any linked services will become inactive), but the registration record will remain on file with the registry. At this point, the registrant is still able to reactivate their domain by updating their registration data to satisfy the eligibility requirements, thereby removing the Withdrawn status. 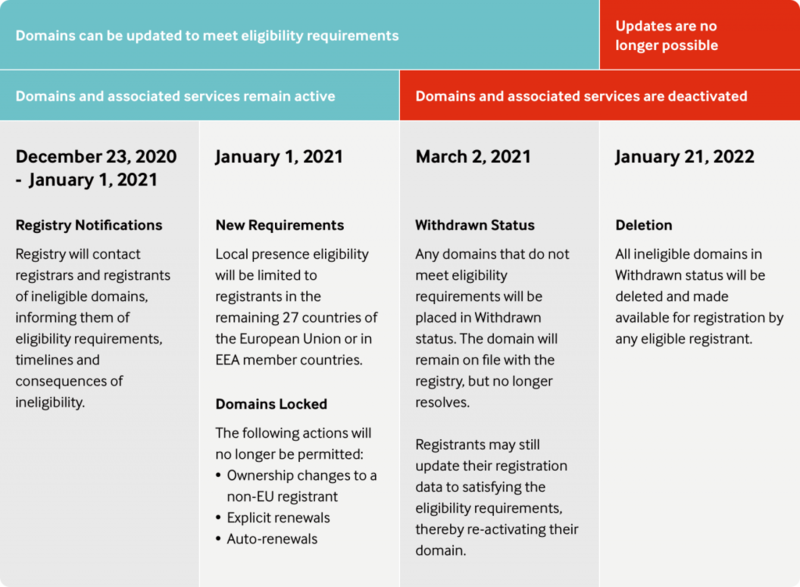 On March 30, 2020, at 00:00 CET (March 29, 2020, 19:00 EDT), all ineligible domains in Withdrawn status will be deleted and made available for registration. There are, no doubt, many EU27 citizens who reside in the UK and own a .EU domain name. These registrants, though still EU citizens post-Brexit, would become ineligible on March 30, 2019, as the current EURid policy determines eligibility based on the physical address of the registrant. However, the EU Commission has announced policy changes which would allow EU citizens based in the UK to regain eligibility. The registrants would, therefore, lose their eligibility upon the UK’s withdrawal from the EU on March 30 2019, but would likely become eligible again once the new .EU regulatory framework comes into force later this year. Unfortunately, it’s not yet clear how long of a gap there will be between the UK’s withdrawal from the EU and the implementation of updated .EU policy. In December 2020, EURid will contact existing registrants who have listed a postal address have with a GB or GI country code, giving them “the possibility to demonstrate their compliance with the .eu regulatory framework by updating their contact data.” Once again, for organizations, this would involve indicating a legally established entity in one of the eligible EU27 or EEA Member States. For individuals, this would involve updating their residence to a physical address located in one of the EU27 or EEA Member States. The registrant could also choose to transfer the domain name to an EU resident. During this two-month window, registrants who wish to keep their domain active must update their contact info to satisfy the eligibility requirements or transfer the domain to an EU resident. On March 2, 2021, at 00:00 CET (March 1, 2021, at 18:00 EST), any registrant who has failed to demonstrate their eligibility will have their domain placed in Withdrawn status — the domain won’t resolve (and any linked services will become inactive), but the registration record will remain on file with the registry. At this point, the registrant is still able to reactivate their domain by updating their registration data to satisfy the eligibility requirements, thereby removing the Withdrawn status. On 1 January 2022, at 0:00 CET (December 31, 2021, at 18:00 EST), all ineligible domains in Withdrawn status will be deleted and made available for registration. As mentioned above, an updated .EU regulatory framework that will allow for .EU domains to be registered by EU citizens living in the UK will come into effect in 2019. Therefore, EU citizens living in GB or GI would NOT become ineligible as a result of a “soft Brexit.” Depending on how EURid implements the new policy directive from the EU Commission, EU citizens living outside of the EU could potentially be required to actively validate their eligibility in order to maintain their registration. In the event of a “soft Brexit” where the deal includes provisions for .EU domains, EURid would forgo the transition plans outlined in the scenarios above and instead adopt whatever transition plan the provisions call for. The OpenSRS team is exploring how best to approach this situation and find solutions to minimize the impact on registrants. If you sell .EU domains we strongly encourage you to sign up for our .EU-Brexit Updates, an email series we will use to share developments, recommendations for resellers, and information about our own action plan, including how resellers can identify domains in Withdrawn status via the Control Panel and API. Have you already given this situation some thought? If you’d like to share your approach, ask questions about this change, or provide feedback, please get in touch. In the meantime, we have a few recommendations for our affected reseller partners. 1. Consider restricting multi-year renewals and registrations for .EU domains. This will help avoid situations where a UK customer pays a sizable renewal fee, only to lose their .EU domain a few months later. It’s important that before registering a .EU domain, your UK-based customers are made aware of the impending change to the domain’s eligibility requirements. We recommend displaying a warning to customers attempting to register a .EU domain using a GB or GI address. 3. Keep in mind that the registry could contact your customers as early as March 23, 2019. We recommend preparing to contact your affected customers before March 23, 2019, so that, in the event of a hard Brexit, the notice from the registry doesn’t come as a surprise. Over the next couple of weeks, we’ll provide more information that will help to inform your communications. 3. Advise those registrants who can to update their information to meet the eligibility requirements as soon as possible. This will ensure their domain(s) does not fall into Withdrawn status and become inactive. Once again, if you sell .EU domains, we highly encourage you to subscribe to our .EU-Brexit Updates series to stay up-to-date as things develop.